This government is 'institutionally indifferent' - to evidence, to criticism by the UN, MPs and inspectors, and most of all, to the suffering of those affected by its ignorant policies. The past year or so has been marked by the exposure of the state’s ‘institutional indifference’ towards marginalised citizens and residents in a number of spheres. I borrow the term from Doreen Lawrence who used it in relation to Grenfell and the treatment of social tenants generally (1). She identified institutional indifference in both the roots of the Grenfell tragedy and in some of the responses to it. And she linked that institutional indifference to questions of race and class, which meant that the concerns and complaints of residents were all too often ignored or treated as a nuisance because the residents did not count, were not worth listening to. Government – central and local - has now been forced to listen, even if they still don’t always appear to hear. Examples of institutional indifference abound. Those explored here concern the “hostile (now compliant) environment” created by immigration policy and social security. This year’s most glaring example, exposed by the admirable work of the Guardian’s Amelia Gentleman, is the Windrush scandal – the denial of the rights of a group who came to the UK from Commonwealth countries in the post-war era leading to loss of homes, jobs, healthcare, pensions and social security, wrongful detention and in some cases even deportation or refusal of re-entry. In the words of the Commons Home Affairs Committee “their settled life in the UK [was] unjustly taken away from them” (2). The committee lambasted the Home Office for ignoring warnings over many years as it pursued and intensified its hostile environment policy. This was preceded by an equally damning report from the parliamentary Joint Committee on Human Rights. The summary of their investigation of the case files of two individuals who were wrongfully detained provides a telling example of institutional indifference. It “confirmed that Home Office officials discounted ample information and evidence – the individuals’ accounts of their lives; evidence and pieces of information on case files; representations from family members, lawyers and people who had known them for decades; letters and representations from MPs - all of which were consistent and clear representations on behalf of these individuals meeting their accounts of their lives which should have sufficed to ensure that such individuals were not deprived of their liberty. However, somehow it did not trigger the appropriate response and these people were not listened to and were wrongfully detained” (3). What finally appears to have triggered a response was the happy coincidence of the cumulative impact of the stories appearing almost daily in the Guardian and the forthcoming meeting of the Commonwealth Heads of Government, which David Lammy MP used to press the issue in parliament. But even then, according to the JCHR, “the Home Office does not appear to have acted like an organisation that had discovered it had made serious mistakes” – mistakes with serious implications for the human rights of those wrongly subjected to immigration procedures and detention. The Committee is scathing about the Home Office’s attempt to explain what happened as “a series of mistakes” and instead points to the likelihood of systemic failure (4). The whole episode has shone a much-needed light on the hostile environment policy that has driven successive immigration laws. The first response of the new Home Secretary was to relabel it a “compliant environment”. But as the UN Special Rapporteur on contemporary forms of racism said in a recent statement on the UK: “shifting from the rhetoric of hostile environment to one of a compliance environment will have little effect if the underlying legislative framework [rooted in the 2014 and 2016 Immigration Acts] remains intact” (5). So far, apart from a few minor easements, it does indeed leave that legislative framework intact, leaving the Home Affairs Committee “unconvinced” that the actions taken properly address the problems they had identified. The UN Rapporteur highlighted “an immigration enforcement framework that deputizes immigration enforcement to private citizens and civil servants in a range of arenas”. One example cited is the racialised impact of the right to rent requirement that landlords must check the immigration status of all potential tenants and deny tenancy to undocumented immigrants or risk penalties. A recent report to government by the Independent Chief Inspector of Borders and Immigration concluded (6) that there has been no attempt to measure the impact – despite concerns raised by the Residential Landlords Association and others about its discriminatory effects. The government’s rejection of the Inspector’s recommendation for a proper evaluation simply compounded the institutional indifference shown to the policy’s effects. Other examples of institutional indifference come to light regularly. One, not created by the hostile environment, but aggravated by it, is the exorbitant fees charged children who are not automatically British because of their parents’ status, despite being born in the UK or having lived most of their lives here. They nevertheless have rights to register as British citizens – but are charged over £1000 to do so, of which only £372 is attributable to administrative costs. Unsurprisingly, many cannot afford it. The Home Affairs Committee points out, “there are parallels with the Windrush generation and their children, in that they are undocumented, have lived in the UK since an early age (or were born here) and consider themselves to be British” (7). The committee warns the government this is a problem it must solve: “a failure to do so will leave many in a precarious position, unable to study, work or seek the support of social security as they transition into adulthood”. Lawyers and activists have been campaigning on this issue for some years, but they are only now getting a public hearing post-Windrush. Social security is another policy arena marked by institutional indifference towards the lives of marginalised citizens. As universal credit rolls out millions of existing tax credits and benefits claimants are migrated onto the new benefit, the cosy political consensus that it is a ‘good thing’ is becoming increasingly fractured. Calls are starting to be heard for it not just to be stalled but to be scrapped. Universal Credit’s architects ignored early warnings of the likely damaging impact of its goal of transformational behaviour change, which sought to impose middle class values regardless of the realities of life on benefit. So we see ‘institutional ignorance’ at the heart of so-called welfare reform: “an ignorance that is not one of blissful unawareness or innocent absence of knowledge, but rather of rational calculation” (8). In other words, institutional ignorance born of institutional indifference. We can see it again in the lack of official interest in what happens to people who have been sanctioned or subjected to various social security cuts; and the refusal publicly to accept the mounting evidence of the relationship between sanctions, benefit cuts and delays, and the evidence of the emergence of destitution and growing reliance on food banks. 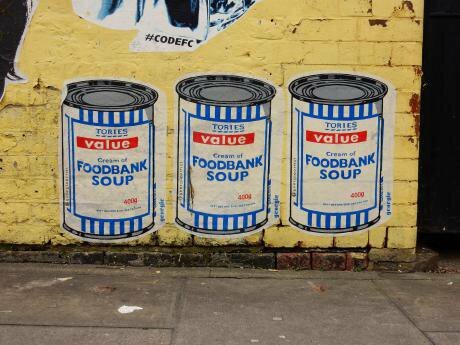 To quote Frank Field MP, chair of the Work and Pensions Committee, who has turned into a fierce critic of universal credit when faced with the evidence, the role of government is changing from “a line of defence against destitution to becoming an active agent in its creation” (9). Shocking as it is, destitution must be understood in the context of the much wider and more entrenched experience of poverty, which the government also tries to downplay. The government’s indifference to the impact of its universal credit reforms hit the headlines when the Secretary of State, Esther McVey, was publicly taken to task by the head of the National Audit Office for misrepresenting to parliament its damning report on universal credit. Among other things, the NAO report observes how the Department of Work and Pensions often dismissed “evidence of claimants’ difficulties and hardship” instead of working with organisations that represent and support claimants “to establish an evidence base for what is actually happening” (10). The NAO report was soon followed by a Public Accounts Committee report on errors in the transfer of claimants to employment and support allowance, which criticised the DWP’s “culture of indifference to underpayments” and a “management culture which does not proactively and systematically act on intelligence from its front line and fully address mistakes when they first occur”. This ‘was compounded by a lack of willingness to listen to experts and stakeholders’ (11). As the criticisms mounted, McVey finally responded in a speech promising a ‘culture of mea culpa’ which would listen to people on the frontline (12). And a leak to the Guardian revealed top secret DWP plans to investigate the link between their policies and food bank use, which they have hitherto steadfastly denied (13). Then there’s the sad saga of the devolution of crisis support from the national social fund to discretionary local welfare assistance schemes (for which there is no ring-fenced budget). By last Autumn around 1 in 6 authorities had abolished their scheme altogether and many more had cut back drastically. Research into the schemes by the Childrens Society and Church of England paints a picture of the retreat of the state from the provision of crisis support, with the voluntary sector filling in as best it can (14). When challenged in the Lords (15) as to whether the government accepted the warning of the Work and Pensions Committee that it maintains “an ongoing obligation to ensure provision of a safety net which prevents vulnerable people from falling into severe hardship”, the minister responded with platitudes about empowering local authorities with new flexibilities – what we might call the Pontius Pilate approach to policy-making. Institutional indifference matters not just because of its material consequences for marginalised groups but because, in the words of George Bernard Shaw, to be indifferent towards our fellow human beings is “the essence of inhumanity” (16). This makes it the more important that we expose incidences of institutional indifference because the moral of this story is that it is possible at times and under certain conditions to puncture it and force the government to respond, even if inadequately. This article is based on Ruth’s presidential address to the Social Policy Association annual conference earlier this year. Doreen Lawrence ‘Grenfell inquiry brings painful memories of the fight for justice for my son, Stephen’, The Observer, 3 June 2018. Home Affairs Committee, The Windrush Generation, HC 990, July 2018, p3. Joint Committee on Human Rights, Windrush Generation Detention, HC 1034/HL Paper 160, June 2018, p3. Office of the High Commissioner on Human Rights, End of Mission Statement of the Special Rapporteur on Contemporary Forms of Racism, May 2018, para 38. Chief Inspector of Borders and Immigration, An inspection of the ‘Right to Rent’ scheme, March 2018. Home Affairs Committee, as above, para 123. Frank Field, ‘Hitting rock bottom’ in Burning Britain? ed. Eamonn Ives and Frank Soodeen, Bright Blue/Joseph Rowntree Foundation, 208, p30. National Audit Office, Rolling out universal credit, June 2018, para 17. Committee of Public Accounts, Employment and Support Allowance, HC975, July 2018, paras 2-3. Esther McVey, speech to Reform, 19 July 2018. ‘Ministers’ secret plan to assess role of austerity in food poverty’, The Guardian, 2 August, 2018. Not making ends meet. The precarious nature of crisis support in England, Children’s Society/Church of England, May 2018. George Bernard Shaw, The Devil’s Disciple, Act II.